Success in terms of quality of all our products depends entirely on the amount of diligence that goes into the processing stage. There are several steps detailed steps involved in processing a cloth from its yarn stage to a final, fully produced garment product. 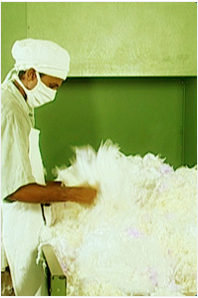 We take great care in ensuring that the best cotton is sourced to produce our high quality yarn. The yarn is then processed using state-of-the-art machinery which in turn produces the best material for weaving. Just prior to the weaving is the sizing process which involves interaction between the fibre type and the yarn type, sizing chemical and other preparatory procedures. Our weaving is done using very advanced and sophisticated weaving machines. 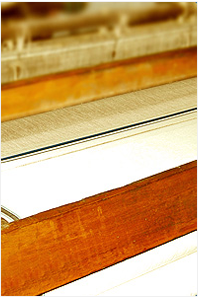 We use a combination of several types of weaving machines or looms in order to yield the best quality output. The fabric is produced by interlacing warp and weft threads, which encapsulates the basic process of weaving. After this, colour is applied to the fabric using various methods of dyeing, depending on the type of fibre, at different stages of the garment production process. Although dyeing can be done at any stage we choose to dedicate a specific stage for this all-important process. We use several dyeing processes such as direct dyeing, stock dyeing, yarn dyeing, piece dyeing, solution pigmenting and garment dyeing. 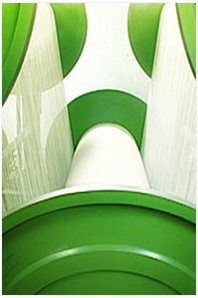 Direct dyeing and yarn dyeing are standard and therefore most heavily used. Following this is the printing stage. 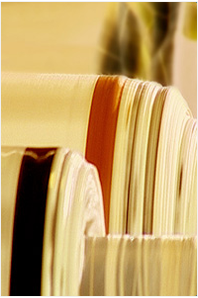 There are mainly five methods of printing; block, roller, screen, heat transfer and ink-jet printing. In most of these cases the dye or pigment is applied to the surface of the fabric through the medium if a print paste. Ink-jet is slightly different as it involves a non-impact method with no contact with the fabric. The end quality of the product is determined by the finishing process which involves drying of the fabric after the washing and dyeing process. It is performed by methodically applying heat and pressure on the cloth, with or without steam, to remove moisture, creases and to impart a flat appearance to the cloth. This is done mainly to improve the look, feel and durability of the fabric and lends a positive spin on the final outcome of the product thus adding value. The finishing process, whether mechanical or chemical would vary according to the type of fibres such as synthetic (polyester) or natural (wool, cotton). The final step is checking or inspection before despatching the products to the retail outlets or to the wholesale buyers, as the case maybe. There is a thorough and detailed quality control and supervision at every step of the production process. 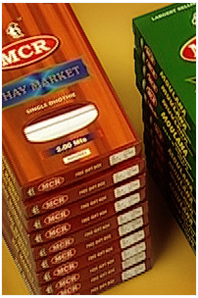 We strive to uphold our promise of defect free products. 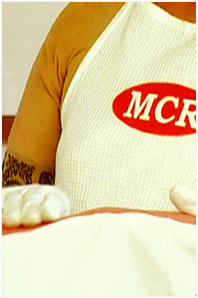 That is an MCR guarantee. Our supply chain management and stock updating systems allow for greater precision in delivery and hassle free transactions. Folding and packing of the garments some next. These are done as per specifications of the buyers. In case of vertically integrated organisation such as ours, as per the decision or requirement of the showroom and its requisite arrangement.